Reportage Paris Design Week, Kingz.fr, September 17, 2015. Straw-k brand new concept in the art field, Artrevealmagazine.com, June 16, 2015. Alexandra Singer-Bieder x Sofia Bennani - Straw-k'Art, Bizarrebeyondbelief.com, June 9, 2015. Le CV déco de Straw-k, Journaldesfemmes.com, June 3, 2015. Le Straw-k'Art à Paris, Artsicmic.fr, May 19, 2015. Interview des architects à l'origine du Straw-k'Art, Kingz.fr, May 16, 2015. 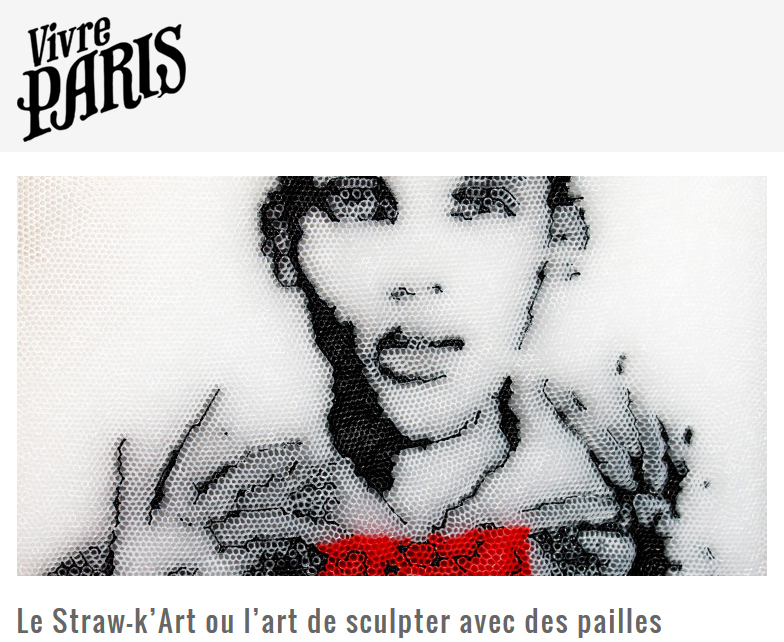 Le Straw-k'Art ou l'art de sculpter avec des pailles, Vivre.paris, April 30, 2015. Da Straw-k a Straw-k Art – Le cannucce strutturali, Artwort.com, March 30, 2015. One Word: Plasticity, Architectmagazine.com, July 30, 2014. The finalists ofTEX-FAB’s “Plasticity” digital fabrication competition, Bustler.net, July 22, 2014. 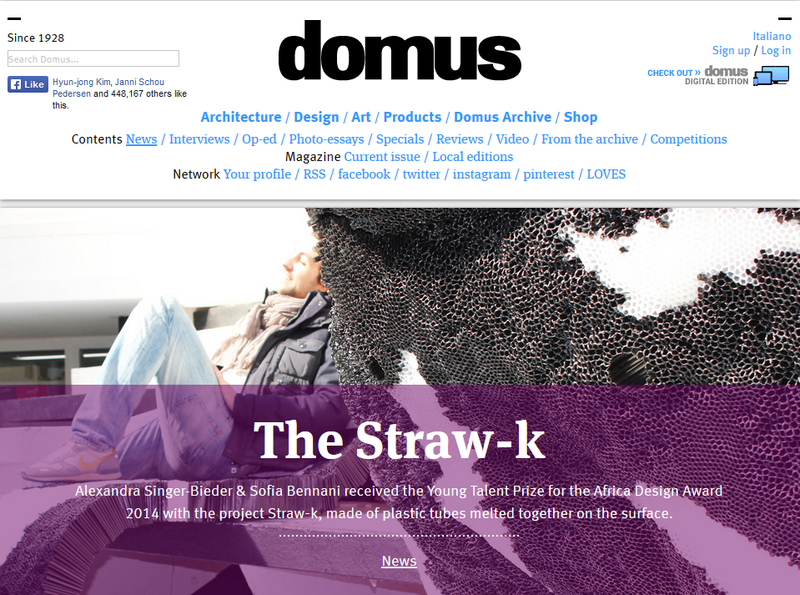 The Straw-k, Domusweb.it, June 25, 2014. A look into the Straw-k installation, the Young Talent Prize winner for the Africa Design Award 2014, Bustler.net, June 17, 2014. Africa Design Award - Lauréats du Prix Jeune Talent, Architecturedumaroc.com, June 2014. Résultats Africa Design Award 2014, Amush.org, May 24, 2014. The Straw-k, Suckerpunchdaily.com, August 8, 2013. Mohamed Akazzahou, Maricaines, jeunes et créatrices (p.30-31), Kechinside n°1, July-August 2015. Corinne Verner, Straw-k'Art, High-tech artisanal (p.34), Maisons du Maroc n°116, July-August 2015. Kaoutar Laili, La correspondance de Sofia Bennani et Alexandra Singer-Bieder (p.41), L'Officiel Maroc n°58, June 2015. Straw-k, Straw-k à Modus Galerie du 4 au 17 mai (p. 19), Le Monde n°21862, 2 - 3 May 2015. Straw-k, Le Straw-k'Art, Le tube de l'Art (p. 121), L'Express n°3330, 29 April - 5 May 2015. Straw-k, Le Straw-k'Art, Le tube de l'Art (p. 88), Marianne n°937, 3 - 9 April 2015. Alexandra Singer-Bieder & Sofia Bennani,The Straw-k (p. 52-57), T3xture Archizine n°1, Editors Craig Purcell & Randy Sovich, October 2014. Alexandra Singer-Bieder, Sofia Bennani & Agathe Michel, Viscoplasty (p. 269-270), Acadia 2014 Design Agency Projects, USC University of Southern California. Alexandra Singer-Bieder & Sofia Bennani, Investigation sur la matière à l’ère du numérique, Meilleurs Diplômes de l’Ecole Spéciale d’Architecture 2012-2013, Ecole Spéciale d’Architecture, June 2013. Blooom Award byt Warsteiner nominee and selected in the Top 70, August 2015. Africa Design Award Young Talent Prize 2014, May 2014. Special Commendation For the Best diplomas Price exhibition, Ecole Spéciale d’Architecture, June 2013.